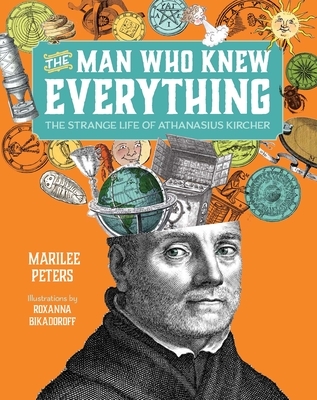 The Man Who Knew Everything is a biography of Athanasius Kircher, a 17th-century German Jesuit and scientist. He was one of the modern world's first scientific celebrities--the Einstein or Stephen Hawking of his time. In 1638, Kircher was lowered into the smoking crater of Mt. Vesuvius to observe how volcanoes work. After thirty years, he published an 800-page volume of his findings--along with theories about fossils, geography, the Earth's core, dragons, the location of the lost city of Atlantis, and more. Kircher has been described as the last Renaissance man, the first postmodernist, and "the man who knew everything." The Man Who Knew Everything celebrates Kircher's insatiable curiosity, his willingness to ask questions and to suggest answers, even when he sometimes got it wrong. Peters' dramatic re-telling of Kircher's life is complemented by colorized versions of his etchings, and lively illustrations by the award-winning artist, Roxanna Bikadoroff.